This is a piece from my archive of high grade toys. It comes from a toy store that closed in Brooklyn, NY in 1986. IT was back stock. I had a full case of these MEGO pocket heroes and this is one of my few remaining case fresh, mint, glossy, unpunched figures. It is certainly investment grade! It will meet all AFA criteria for a solid grade. BATMAN POCKET SUPER HEROES MEGO UNPUNCHED CARD 3 3/4"
It will meet all AFA criteria for a solid nm to mint rating. Clear bubble, undamaged card, unpunched. 1979 MEGO POCKET SUPERHEROES SPIDER-MAN UNPUNCHED MOC! 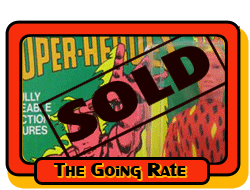 Up for auction is a 1979 MEGO Pocket Superheroes Spider-Man unpunched figure. Very hard to find these anymore and this one is in near mint/mint condition. The bubble is clear and is firmly attached to the card. The card itself is in near mint/mint condition. This item comes from a smoke-free home/ Bid with confidence! or sale is a mint 1979 Mego Pocket Super Heroes Superman action figure in its unopened original packaging. The action figure is still sealed in its packaging and has recently been found in a basement where it was stored in a cool and dry place since 1979. Completely mint condition, as if someone had travelled back in time and brought this back from the late seventies. This is a rare collector's item that is hard to find in such amazingly mint condition!